62% of voters believe the federal government spends too little on public education (it accounts for just 2% of the budget). Do you agree? Join National PTA in telling Congress to #STOPCutsToClassrooms. Sign our petition, print out our official sign and challenge your friends to do the same! To get the full instructions, visit PTA.org/StopCuts. Despite the best of intentions, reading and writing often take a back seat to other activities over the summer—speech-language pathologists working in schools often see a literacy lag as students return to the classroom. Don’t panic! Instead, plan to use the 10 days before school starts to get your child up to speed. Read more. Whether they are just starting elementary school or are getting ready to graduate high school, every parent wants their child to have the knowledge they need to be successful in the future. However, sometimes it can be difficult to keep track of everything your child needs to know. That’s why National PTA created the Parents’ Guides to Student Success. Read more. August is always a stressful time for parents sending their kids back to school, especially for parents of children with severe allergies. Anaphylaxis is a life-threatening allergic reaction resulting from exposure to allergens. Whether your child has a severe allergy or not, it is up to all of us to make sure that we keep schools as safe as possible for all children. Read more. Get ready for the school year by checking out the USA TODAY Back to School Magazine. Find everything from school supplies to creative snack ideas by visiting usat.ly/2uQjVco. What Makes a Good ESSA Report Card? Did you know that there are four different kinds of report cards? It’s true! Student, School, District and State Report Cards are required by ESSA, the new K-12 education law. Watch this recorded webinar to learn how these report cards equip parents to make better decisions concerning their children’s educational opportunities and become more effective advocates. Watch now! Become a Monthly Donor to National PTA! For 120 years, National PTA has been a powerful voice and advocate for all children. Become a monthly donor and you can make a difference in the education, health and welfare of children across the country. For more info, visit PTA.org/MonthlyGift. This back-to-school season, tell your school’s teachers how they can help kids learn about and care for the planet through the Tom’s of Maine Green Your School Fund. $1 million is available to public schools nationwide—teachers can learn more and submit a project at GreenSchoolFund.com. Flexible, part-time schedules. Family-like environment. Career growth and opportunities to earn additional income. Consider a career at H&R Block! Learn more about the Income Tax Course and H&R Block at HRBlock.com/Class. 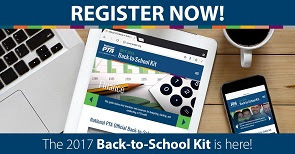 Register now for the 2017-2018 PTA Back-to-School Kit. You have the power to #STOPCutsToClassrooms. Join our social media challenge. Go Back-to-School with the PTA-NEA Family Guides. Time is running out! Get $1,000 to host a STEM + Families Math Night. Encourage your local PTAs to become National PTA Schools of Excellence! National PTA, in partnership with the National Education Association, is pleased to announce the release of the updated PTA-NEA Family Guides. These guides help families navigate common topics related to improving student outcomes and engaging families in their child’s education. Topics include Preparing Your Child for School, Making Sure Your Child Gets the Education they Deserve, Helping Your Child with Today’s Math and Testing at Your Child’s School. Visit PTA.org/FamilyGuides to see these and more! Give the PTA Leaders, Finance and Membership sections extra attention. We’ve revamped them to make these sections even more user-friendly. We will be hosting a PTA Live! series on Facebook about the Back-to-School Kit. Mark your calendars for Wednesday, August 16 at 2 p.m. EDT and Friday, August 25 at 1 p.m. EDT. Join Us To Celebrate Our 2017 Hearst Award Winners! Join us on FacebookWednesday, August 23 at 3 p.m. EDT for a PTA Live! where we will announce this year’s Hearst Award Winners, National PTA’s highest honor. The Phoebe Apperson Hearst Awards are presented to PTAs that have earned the National PTA School of Excellence designation and demonstrated outstanding success engaging families. Time’s Running Out: National PTA STEM + Families Grants Available! The 2017 National PTA STEM + Families Math Grants, sponsored by Mathnasium, will award local PTAs $1,000 to host a STEM + Families Math Event at their elementary school this fall. To be considered, have your local PTAs submit a completed application online (We also have the application in Spanish) by Aug. 31 at 8:00 p.m.
Visit PTA.org/STEM or email Programs@PTA.org. Watch on Facebook now! Or, take the survey! What does it take to be a National PTA School of Excellence? The Congressional App Challenge (CAC) is a congressional initiative to encourage student engagement in coding and computer science through local app challenges hosted by the Members of Congress. The CAC aims to bridge the gender, geographic and racial gaps in tech. During the next 14 weeks, thousands of students in participating Congressional districts will create and submit their own original applications, that will be evaluated by panels of local judges. To get involved or for more info, visit CongressionalAppChallenge.us. At the 2017 National PTA Convention and Expo in Las Vegas, PTA members voted to amend certain provisions in Articles IV, V, X and XI of the National PTA Bylaws. You can view the amended bylaws at PTA.org/Bylaws. You have the power to #STOPCutsToClassrooms. Join the campaign. National PTA has a new president! Read about Jim Accomando in our press release. Get $1,000 to host a STEM + Families Math Night! Encourage your local PTAs to become a National PTA School of Excellence! The 2017-2018 PTA Back-to-School Kit is Here! As a hardworking volunteer for your PTA, we know the 2017-2018 Back-to-School Kit will help make your upcoming school year a complete success. When you register for this year’s kit, you’ll get a Recruitment Tool and a poster-sized Calendar of PTA events. We will mail them at the end of July. Did you know that Federal funding for public education programs has remained at 2% of the federal budget for decades, despite the increase in public school enrollment and the rising cost of education resources and services. This disparity between funding levels and actual costs means that the federal government has essentially enacted cuts to classrooms. National PTA is running a nationwide campaign—from July 7 to September 29—to raise public awareness that current levels of federal education funding are an inadequate investment in our children. To learn more about the nationwide campaign and get involved in PTA’s advocacy efforts visit PTA.org/STOPCuts. National PTA’s 2020 Strategic Vision includes a goal to advance family engagement across the nation by establishing a Center for Family Engagement. To do so, we will be spending the next few months gathering input from members about our vision, definition and strategy for supporting family engagement at PTA. We would like to hear from you! Please share your perspective by taking three minutes to complete this brief poll. Spread the Word: National PTA STEM + Families Grants Available! Do you have questions about the process, the application or what a Math Event looks like? Join us for a webinar July 18, 3 p.m. EDT. Register now, visit PTA.org/STEM or emailPrograms@PTA.org. Support Your Local PTAs in Becoming Nationally Recognized Schools of Excellence! National PTA School of Excellence is a recognition program that grows partnerships between PTAs and schools to improve the educational experience and overall well-being for all students. By enrolling in this program, PTAs and school administrators are making a year-long commitment to identify and implement an action plan for school improvement based on PTA’s National Standards for Family-School Partnerships. ENROLL NOW at PTA.org/Excellence and learn more by watching our PTA Live! about the program on Facebook. Parents and their children are the consumers of our nation’s public education system, and parents have always been essential partners in education. However, they haven’t always been included at the decision-making table. The Every Student Succeeds Act (ESSA) provides a unique opportunity for parents and families to give their input and to hold states and districts accountable for their children’s educational experience. In this new resource, National PTA has identified six critical ways states, school districts and schools should be engaging parents and families as part of ESSA, and all new education initiatives. Use the rubric on the back to evaluate how your state, school district and school are doing! Join National PTA’s Associate Manager of Digital Communications, Ashley Collier, and Fullerton PTA President Joanne DeAngelo, for a look at how to tell stories on various social media platforms. Watch on YouTube now. Join Scott Meeks, National PTA’s Communications Manager, for a look at how you can tell better stories through video. He’ll share tips and guidelines that will help you visually showcase the amazing work being done within your PTA. Watch on YouTube now. Join National PTA’s Associate Manager of Programs & Partnerships, Amy Weinberg, to find out the answers to our three most commonly-asked questions about the School of Excellence program. Watch on Facebook now. State education agencies will soon be releasing draft state plans on ESSA, laying out how they plan to implement the law and what impact it will have on public education. When these drafts are released you’ll have the opportunity to make your voice heard by making a public comment on the plan. Join this webinar to learn how and to get some tips. Watch on YouTube now. PTA leaders have an important role in connecting immigrant families to community and school resources to help these families feel more engaged and welcomed in their schools. Watch on YouTube now. Renowned psychologist Dr. Mary Alvord delivers information from the latest Stress in America report and offers suggestions for families on managing their children’s technology use. Watch on YouTube now. Win with PTA … the 2017 National PTA Convention & Expo was a great success! Thank you to those who attended. You can watch the recording of the Symposium—Today’s Parents, Tomorrow’s Leaders: Growing a New Generation of PTA Champions on Facebook! Watch on Facebook now. You can also watch the recording of General Meeting 7, during which our new National PTA officers were installed! Watch now at PTA.org/Live. PTA members adopted one resolution and one amendment to an existing resolution at this year’s Convention and Expo. The adopted resolution is about Healthy Sleep for Adolescents. This resolution urges PTA members to educate the community about the positive impact that sufficient, quality sleep has for teens’ health, safety and academic success, and to urge policymakers to develop solutions and policies to encourage quality sleep for teens. PTA members also amended the Sale, Resale and Destruction of Firearms resolution to include a provision about the importance of having research on the causes and effects of gun violence. The National PTA board of directors also passed a Rights and Services for Undocumented Children position statement stating all students, regardless of immigration status, have a right to quality, free public education, students’ immigration status must be kept private and that schools should be “sensitive locations” where immigration authorities cannot enforce laws. Is your state doing what it should to get families involved in ESSA? Use our new resource to find out! Catch up with PTA! We’ve had a lot of great webinars recently. More details on how to watch them below. What makes the “PTA Difference” so much better for schools? Find out below. Become a National PTA School of Excellence! Details below. Need help with training during your leadership transitions? Take a National PTA e-learning course! In our new resource, National PTA has identified six critical ways states, school districts and schools should be engaging parents and families as part of ESSA or any new education initiative. Use the rubric on the back to evaluate how your state, school district and school are doing! Enroll Now to Become a School of Excellence! Maybe you are looking to step up your PTA’s involvement in school improvements. Maybe something meaningful is already happening between your PTA and school, and you would like to see that recognized. In either case, the National PTA School of Excellenceprogram offers customized tools to help you to make a substantial, positive impact on school and student success, and to earn acknowledgement for your PTA and school. What Makes the “PTA Difference” So Much Better for Schools? Your event is in full swing—the room is decorated, there’s a great turnout, the fundraiser is making money and everyone is happy … But then someone gets hurt and you realize that you forgot to purchase insurance. Now what? If you’re an unaffliliated parent group, you’re on your own. But, if you’re a PTA, you know that the path to fixing these issues is as simple as making a phone call or sending an email. You’re covered! See more benefitsto being part of the PTA community at PTA.org. Summertime means sun and fun, making it the perfect time for learning to come alive for your child! But as parents, we know it isn’t always easy to keep children engaged during the break. That’s where the “Summer Stride” comes in! Developed by Learning Heroes, the National Summer Learning Association and National PTA, read five simple ideas to help your child stride forward this summer. You can watch the recording of the Symposium—Today’s Parents, Tomorrow’s Leaders: Growing a New Generation of PTA Championson Facebook! Watch on Facebook now. Are you ready for Teacher Appreciation Week? We have resources in English and Spanish! 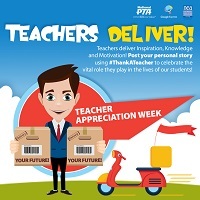 Visit PTA.org/ThankATeacher. What makes the “PTA Difference” so much better for schools? See below. Families are often unware of the presence of school-based police officers or School Resource Officers (SROs) and that they are sometimes involved in their child’s education and discipline. They also may not know the scope of officers’ authority. Strategies for Youth has created this “Parent’s Checklist for SROs in Your Children’s Schools” to provide parents with a set of questions that will help parents understand the scope of authority that law enforcement may have in their child’s school. Your event is in full swing—the room is decorated, there’s a great turnout, the fundraiser is making money and everyone is happy … But then someone gets hurt and you realize that you forgot to purchase insurance. Now what? Or, what if you discover some of the fundraising money was stolen? If you’re an unaffliliated parent group, you’re on your own. But, if you’re a PTA, you know that the path to fixing these issues is as simple as making a phone call or sending an email. You’re covered! See more benefits to being part of the PTA community at PTA.org. Every day in May, the Child Mind Institute is unveiling a video from a celebrity or prominent individual who tells a powerful story of hope to his or her younger self about growing up with a mental health or learning disorder. Go to SpeakUpForKids.org and watch the #MyYoungerSelf videos, beginning May 1. Working with over 60 national partners, Attendance Works has launched plans for Attendance Awareness Month 2017 with a webinar and the release of the Count Us In! 2017 toolkit, an essential guide to the templates, tools and strategies for making the most of activities this September. Get your tickets for these amazing events today! Log in to your 2017 National PTA Convention & Expo registration and add tickets to the event to your account. Not registered yet? Why wait? Register now and purchase your tickets at the same time!